Dee was born to a mixed-race family in South Africa during the apartheid era. She was raised and very active in the Anglican church, but grew increasingly disillusioned by the incoherence perceived. By age 19 she stopped going, much to her mother’s dismay. She labeled herself “agnostic,” feeling liberated by philosophical ideas discovered at university. To her, the deepest questions in life were beyond the mind’s ability to understand and she could happily die with unanswered questions. Her life would be guided by one fundamental principle: Treating others as she would like to be treated. Effectively, retaining the core values of Jesus’s teachings that are common to many traditions. It wasn’t until 15 years later that she stumbled upon spirituality. While living in London, a vivid dream and a series of serendipitous events somehow led her to magical Lake Atitlán, Guatemala in 2012. This experience altered her perception of reality forever. The mind was blown, and it became undeniable that there was something beyond it that is a supreme guiding force. She ended up living in Guatemala for 4 years, finding answers to those questions she had given up on. There she studied under the guidance of Chaty Secaira at Las Pirámides del Ka, completing certain levels of initiation and serving as Guardian of Silence, supporting those in silence with practical matters. Blessings came in the form of weird and wonderful experiences, various insights in extended silence and dreams while meditating upon the Kabbalistic Tree of Life and the Divine Tarot. During that phase, she also started teaching yoga and offering healing modalities learned at the lake. 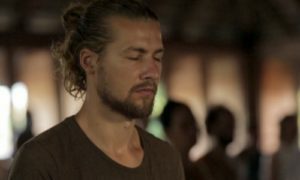 Through even more Grace, she discovered the Hridaya Yoga Center thanks to dear friends Severin Geser and Emma Carruthers, co-founders of The Hermitage. The profound non-dual teachings of the Heart put the spiritual awakening and metaphysical encounters into clearer perspective by creating the conditions for her to reveal the Stillness that is her True Nature. 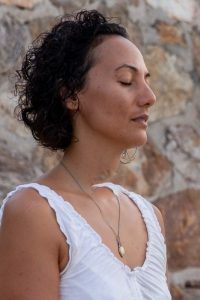 She described her first experience of a Hridaya Silent Meditation Retreat as feeling “like a kid in a spiritual candy store,” overwhelmed by the spanda she was feeling for the first time. She felt absolutely compelled to share these teachings. She completed the Hridaya Teacher Training Course in 2015 and offered the first Hridaya Retreat on African soil a few months later. Listening to the Heart, but getting somewhat sidetracked from the mind’s perspective, she started serving as Hridaya’s General Manager and held this position for nearly two years. It was a deeply intense period of learning and unlearning, of being shown many shadows of her ego in high definition. This left her feeling “tumbled, crumbled, humbled,” an experience best described by St. John of the Cross as the “dark night of the soul.” The Grace and wonder that she had so boldly come to expect now demanded to be met with more effort. This was a necessary phase in her evolution, feeling the truth of Sahajananda’s words. Deconditioning is indeed a process, and she has lots left to do. She is still licking those wounds and integrating the lessons, learning to lovingly embrace all aspects of her humanity and of Life in general. The realization has come that the effort is also the Grace. She aspires to serve with more surrender, more compassion, and more authenticity. She has since transitioned to teaching full-time in Mazunte, where she also offers healing treatments. During regular visits to Cape Town, her intention is to continue offering Hridaya Silent Meditation Retreats.